MLB.com's Jenifer Langosch lists Marc Rzepczynski as a non-tender candidate. Rzepczynski made $504,000 in 2012 and is arbitration-eligible for the first time this winter. Langosch believes that right-hander Kyle McClellan is also a non-tender possibility. Personally, I just can't see the Cardinals cutting Rzepczynski loose, as I suspect the Cardinals recognize that his value will likely outpace even his arbitration award. Even if they didn't feel he was worth, it seems likely that they would trade him rather than non-tender him, but crazier things have happened so we'll consider it for a moment. I was intrigued by Rzepczynski the first time I saw him work in Toronto. He combined good stuff with a lot of polish, but we'll get back to that after a quick detour through his pitching mechanics. Rzepczynski has solid mechanics, which are largely defined by an unusual arm swing that I can't recall having seen seen in any other pitcher...except one. Curiously, that other pitcher also made his MLB debut in 2009. If you compare Rzepczynski with Madison Bumgarner, the mechanics are pretty close. 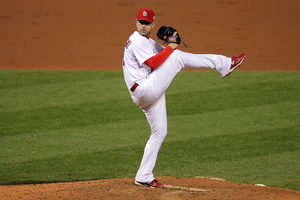 Both pitchers utilize high leg kicks with coil at the apex to build up momentum to impart on the baseball. Each also maintains good balance at the apex of the delivery, while being fairly deceptive with the ball. As both unpack the leg kick and start to drive towards the plate, they incorporate an unusual arm-swing to bring the ball up into the pitching position. Most pitchers use a far less severe arm-swing, but Bumgarner and Rzepczynski both swing their pitching arm directly out towards third base. I can't imagine anyone teaching such an arm-swing, as not only does it seems like an unnatural motion, but it also eliminates any deception in the delivery. The ball is right there for the hitter to pick up. Even so, it's likely the way both pitchers naturally threw the ball when they first climbed up a pitching mound. It certainly works for them. After they use the arm-swing to bring the ball up into position, they use similar stride lengths and throw with similar high-three quarter arm slots. While the mechanics are the same, I'm not suggesting that Rzepczynski is in Bumgarner's class as a pitcher. 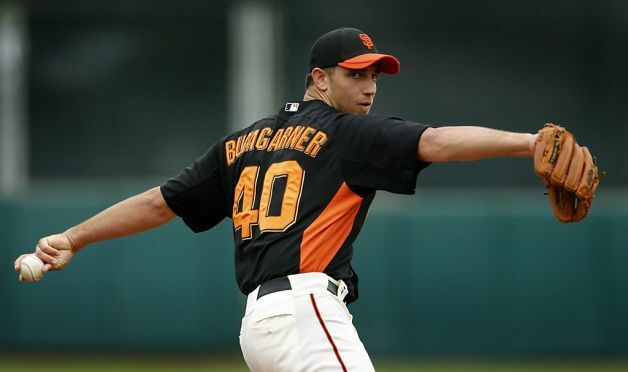 Bumgarner has an advantage in physical stature, which gives him a tick better stuff. And, for whatever reason, Bumgarner has an uncanny feel/command for pitching, which gives him another edge over Rzepczynski. Even so, Rzepczynski has value in his own right. Personally, I think Rzepczynski is being wasted in relief, though his stuff undoubtedly plays up out of the bullpen. Still, I could see him as a solid mid- to back-of the rotation starting pitcher. Given that the Reds are short in the southpaw department, both in the rotation and in the bullpen, adding another lefty would have value. For his career, Rzepczynski has ratios of 3.97 BB/9 and a 8.13 K/9 to go along with a 4.04 ERA and a 1.38 WHIP. One other factor would make him a good fit for the Reds, as he has heavy ground ball tendencies. On his career, he has a 56.1% ground ball rate, which was even better over his last two seasons (64.8% and 58.9%, respectively). To put it in perspective, his career rate is better than that of the Reds two biggest ground ball starters, Johnny Cueto and Mike Leake, who each chimed in with a rate of 48.9%. The acquisition of Rzepczynski wouldn't address an area of immediate need, but adding value is always a good idea. The Reds lacked a southpaw starter in 2012 and, unless they move Aroldis Chapman into the rotation, that will likely be the case in 2013 as well. Further, given the impossibility of relying on the man of glass, Bill Bray, the Reds could use Rzepczynski as a second or third lefty out of the bullpen. If the Reds learned nothing else from the loss to the Giants in the NLDS, they should at least recognize the advantage that having three lefties in the bullpen afforded Bruce Bochy. By having Javier Lopez, Jeremy Affeldt, and late season acquisition Jose Mijares, Bruce Bochy could use a very aggressive approach to running his bullpen. Frankly, that, and his willingness to actually manage aggressively, gave him an advantage over Dusty Baker. Adding an lefty arm like Marc Rzepczynski is a good value play, regardless of whether they would utilize him in the rotation or out of the bullpen. Now, all they need is for the Cardinals to do something foolish to make him available. I probably won't hold my breath. Now that the Giants have salted away the 2012 season and added their second title in three years (seriously, what universe is THIS??? ), it's time to look at the Reds' needs for 2013. The obvious needs are (1) table-setting, (2) bench depth, and (3) finding a replacement third baseman or leftfielder. I was blown away by the caliber of the At Bats in the NLCS. Both the Giants and Cardinals featured a number of professional hitters who combined a disciplined plate approach with an all-fields hitting style. These hitters seemingly never gave away an AB and were difficult to beat. Particularly, Buster Posey and Marco Scutaro for the Giants; Carlos Beltran and David Freese for the Cardinals. I would love to see the Reds add another professional hitter with a disciplined approach, the obvious need being the top of the order spots. There is simply no way the Reds can head into the 2013 season with the same sub-sub-sub-standard table-setters they featured last year. It's almost inconceivable just how putrid the Reds were in the 1st and 2nd spots in the order. And, it's indefensible, especially when you have the best hitter in baseball in the third slot. The number one job for the Reds this offseason is to ensure that Joey Votto has more ducks on the pond in 2013. Given how much the Reds have invested in Votto, the offense will and should revolve around him, which means that putting him in a position to do as much damage as possible is a must. It's almost literally impossible to do worse in 2013. There is an unspoken, and occasionally spoken, idea that the Reds should just ride out 2013 because Billy Hamilton is on the horizon for 2014 and beyond. The first problem is that you simply can't count, or rely, on the great Hamilton to pan out. He's an exciting prospect, but exciting prospects, especially those with questionable hit tools, flame out all the time. Second, there's simply no way the Reds can afford to wait another season without addressing the top of the order. Given how close the Reds came to winning it all in 2012, it's imperative that they seize the opportunity. The time is now. The Reds very easily could have won a championship in 2012. As a Reds fan, it's absurd and surreal to even write the prior sentence, but it's true. For the first time in seemingly forever, there was no huge revenue, dominating AL team lurking in the shadows. No Yankee or BoSox team waiting to club the NL pennant winner into submission. Not even the Rangers, who, while never getting over the hump in 2010 or 2011, were certainly a much more well-rounded team than the 2012 Tigers. The AL was weak this year. While the Reds' flame-out was somewhat understandable, given the loss of Johnny Cueto and the power-sapped Joey Votto, but it's not easy to get over. That's especially true because the Rangers are only getting wealthier, the Angels are likely to be better, the A's more experienced, the Tigers still strong, the Rays lurking, and the BoSox and Yankees will reload to some degree. And, that's just the AL, so the 2013 season will be no cake-walk. I can't support the idea of sitting on our hands and waiting/hoping for Billy Hamilton to be the savior, especially since even if he becomes the next Rickey Henderson we could still slot our 2013 table-setter into the second spot in the order behind Hamilton. I could make the argument (and I probably will later this offseason) that the Reds should make a Mat Latos-type trade for an established, legitimate leadoff hitter. But, for now, I would target an undervalued player who could address a few areas of need. 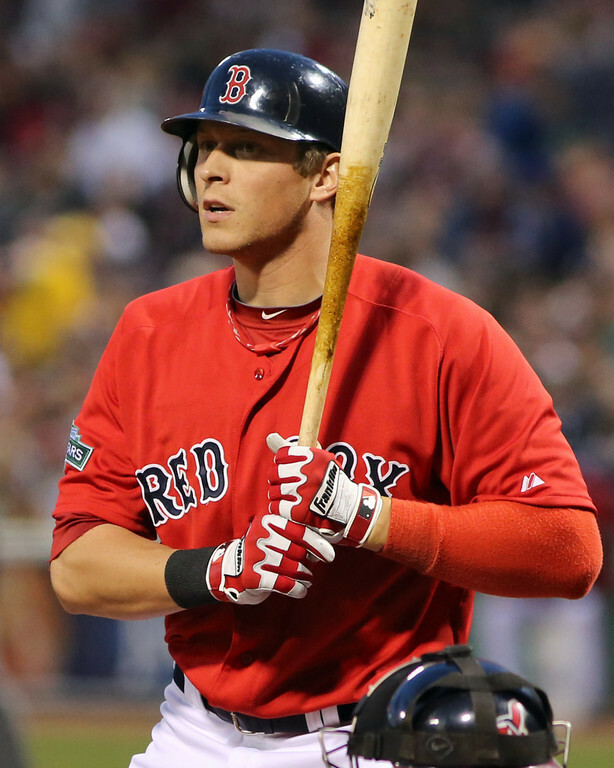 If I was Walt Jocketty, I would definitely make a play for Boston Red Sox outfielder Ryan Sweeney. In the past, I haven't been that high on him because the power never developed. That may preclude him from being a true impact bat, but he can still be a nice complimentary player. And, the boxes he does tick happen to be areas of need for the Reds. As I mentioned above, the Reds need more disciplined, professional hitters and more tough ABs at the top of the order. While Sweeney has had some volatility to his performance, his offensive profile certainly fits the bill. Frankly, I think one area of roster construction where the Reds deserve some criticism is in their failure to bring in players with the right offensive profile for the top of the lineup. It's certainly understandable that they haven't managed to land a legitimate leadoff hitter. They are rare. In fact, I'm not convinced that it isn't more difficult to find a legitimate leadoff hitter than it is to find a number 1 starter. On the other hand, the Reds failure to buy any "leadoff hitter lottery tickets" is less understandable. Maybe it's Dusty's influence that has seen the likes of Corey Patterson and Wily Taveras sprint through the revolving door at the top of the lineup. Maybe it was Walt. Regardless, the Reds have rarely even brought in players who possess the right offensive profile for the leadoff spot. As a result, they have not only lacked a legitimate leadoff hitter, but have never given themselves a chance to catch lightning in a bottle. A good example of lightning in a bottle can be found in the San Francisco Giants championship history. Two times. The Giants are not an organization known for valuing late-count, disciplined hitters, but in both of their championship seasons they won the leadoff hitter lottery with players who fit that offensive profile. In 2010, the Giants got significant contributions from Andres Torres, who hit .268/.343/.479 out of the leadoff slot. Torres wasn't projected to be the full-time leadoff man, but he had the right offensive profile, including two minor league seasons where his OBP was .80+ points higher than his batting average, when his performance peaked. 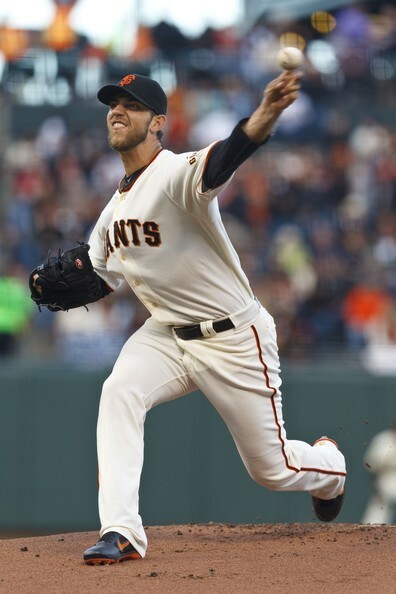 The peaking performance made him a valuable contributor to the Giants' championship push. The same thing happened in 2012, as the Giants once again hit the lottery with Gregor Blanco. They didn't need him in the leadoff slot (rather using him as a second leadoff hitter in the 7th spot), but he had that type of profile and his performance peaked. When Melky Cabrera was nabbed for cheating, Blanco slid comfortably into the starting lineup. Blanco hit .244/.333/.344 on the season after having some hot streaks during the season. Blanco had a strong walk rate and rarely chased pitches outside the zone. While a larger sample size caught up to him, he was a significant contributor for the Giants during the season and in the postseason. The Giants, in both championship seasons, benefited from taking a chance on a hitter with a leadoff hitter profile. The performance level wasn't there going into the season, but the offensive profile was. Sweeney has the offensive profile the Reds desperately need. On his career, Sweeney has a slash line of .280/.338/.378 and has seen an average of 3.99 pitches per plate appearance. However, in his four years with the A's he had OBPs of .350, .348, .342, and .346 in a very tough park for hitters. 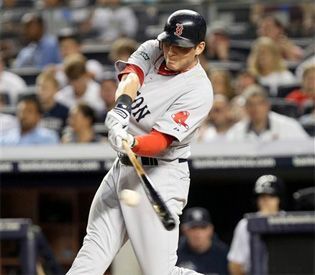 Further, his disciplined approach seems to be improving, as in 2011 with the A's Sweeney saw 4.34 pitches and in 2012 with the Red Sox he saw 4.31 pitches, which made him one of the most disciplined hitters in baseball over the last two seasons. Given that the Reds, as a team, saw 3.80 pitches per plate appearance in 2012, good for only 19th in all of baseball, adding more disciplined plate appearances should be a priority. Further, while Sweeney's power is still underwhelming, that could play up in a hitter's park like Great American Ballpark. Sweeney can also hit, as evidenced by his 21.6% career line drive rate. In fact, his line drive rate hasn't dipped below the 20% mark since his last season (2007) with the White Sox. And, he also makes contact at a very high clip, 88.4% contact rate for his career, which would be good for third on the Reds behind Ryan Hanigan (90.6%) and Miguel Cairo (89.6%). So, Sweeney sees a lot of pitches, draws a good number of walks, makes a lot of contact, and hits a lot of line drives, which gives him the offensive profile the Reds need. And, while his current level of performance is already enough to be a significant improvement for the Reds at the top of the order, there remains a decent possibility of an uptick in performance level to "impact player" for our 2013 championship push. The final reason Sweeney makes sense is that he is a very good defensive player who can handle all three outfield spots. That gives him three possible roles as the roster develops this offseason. He could be the starting centerfielder, if the Reds want to turn the page on the Drew Stubbs era. He could be the starting leftfielder, if the Reds decide Ryan Ludwick is simply too expensive. Or, he could be a 4th outfielder/platoon mate, if the Reds bring back both Ludwick and Stubbs. In addition to the lack of power, Sweeney's other drawback is his durability. In 2012, Sweeney missed time with separate issues, including a mild concussion, a toe injury, and a broken pinkie finger from punching a door after being robbed of a hit by Omar Infante. His 2012 performance level was disconcerting, as he hit a paltry .260/.303/.373, but it's hard to imagine anyone succeeding in the Bobby Valentine tornado of despair. Further, I wonder if concussions have a tendency to linger longer in baseball player performance than in other sports, as hitting is such a highly reactive process. So, that might be at play as well, but the larger point is that a fresh start in hitter friendly park would likely give him a performance boost. As for his availability, the BoSox were reportedly looking to trade him right before he broke his pinkie last season, so he is likely both available and affordable. All in all, Sweeney seems like the right player at the right time for the Reds. To recap, Sweeney (1) has the offensive profile the Reds need, (2) has the defensive ability and position to address the Reds problems, (3) is affordable in terms of salary ($1.75M in 2011), and (4) is likely available at a reasonable cost from the BoSox. Unless the Reds are looking to make a Latos-type move for a legitimate leadoff hitter, Sweeney is definitely worth considering. It's difficult to believe that the Reds, after breaking out to a 2-0 lead in the series and looking like the most dominant Reds incarnation since the Big Red Machine, even allowed the Giants to extend the National League Division Series to a fifth game. But, they did and even took it one step further by letting the whole series slip through their fingers. I suppose the kiss of death happened shortly after Game 2. After watching Bronson baffle the Giants with a combination of slow, slower, and slowest offerings, I had an epiphany that I've never had in my entire life. It occurred to me that the Reds were the team to beat. Not just in the NL, but in all of Major League Baseball. For the first time in my entire rooting life, the Reds appeared to be the best team in baseball. So thorough and complete was the dismantling of the Giants in the first two games that there appeared to be no stopping the Reds. There was almost a sense of inevitability regarding a World Series championship. That was something that I had never previously experienced. And, of course, the wheels on the championship bus ground to a halt immediately thereafter. The death knell sounded in the 5th inning of Game 5, leaving us with nothing more than dashed dreams and the familiar refrain of "wait 'til next year." Latos looked tough in this AB. He got ahead in the count and effectively worked on the periphery of the strike zone. Latos may not have been happy with one of the calls, but this was just a high quality AB by Gregor Blanco, an underrated hitter who has been a sneaky good value for the Giants. 3rd Pitch: 90 mph fastball over the heart of the plate - Triple to right, Blanco scores. Working out of the stretch, Latos started off the AB against Crawford well. His first two pitches were again on the periphery of the strike zone, arguably half the ball was in the zone and half the ball was outside the zone. Latos didn't get either call, but they could have gone either way. They were tough, effective pitches, but I can't fault the umpire for not calling them strikes. Unfortunately, Latos was behind 2-0 and had to come into the hitter. The third pitch was a BIG mistake, a low velocity fastball that up in the zone and right over the heart of the plate. Crawford, the number 8 hitter, didn't miss it, ripping a triple down the right field line to score Gregor Blanco. As tough as the first two pitches were, the third pitch was delivered with a "Hit-Me!" sign on it. It was a clear mistake by Latos and he paid the price. Given how poor the pitch was, it's fair to wonder whether Latos was losing focus out of frustration over the calls he thought he should have gotten against Blanco and Crawford. In fact, after time was called, the ump walked halfway out to the mound without his mask on to throw a new ball to Latos. It's likely that Latos, in some way shape or form, had expressed frustration prior to that exchange. One of the knocks on Latos prior to the season was that he struggled to control his emotions at times, an issue which may have come back to haunt him here. 3rd Pitch: 85 mph breaking ball in middle of plate, chopper back to Latos, holds Crawford at third and throws to first for the out. Here, the first pitch of the AB was well off the plate. Considering (1) how effectively he was working the periphery of the zone to the previous two hitters and (2) that he was facing the pitcher, this pitch was a poor effort. Either Latos was simply losing effectiveness or losing focus, but this was the second poor pitch of the inning, the first resulting in the triple to Crawford. After the first pitch to Cain, Latos got back on track with his next two pitches, ultimately inducing a chopper back to the mound for the 1st out and holding Crawford at third. Pre-1st Pitch: After looking into the dugout, Hanigan calls time, drops shoulders and head, pats his mitt a few times, his body language expresses frustration...with a delay in either the pitch or defensive call being relayed from the dugout??? 2nd Pitch: 92 mph fastball, up and in, that Pagan chops to shortstop Cozart. With the infield playing in, Cozart tries to come home to get Crawford, who was running on contact, but loses the handle on the ball on the transfer and everyone was safe. It was a bad camera angle on the pitch, but Hanigan, who appeared to be setting up outside, reached a long way for it and it looked like a significant location mistake. In hindsight, this AB is where it became clear that things were unraveling. Given that the Reds were in an "all hands on-deck" situation, it would have been appropriate for Dusty, if he noticed the signs, to get someone up in the pen with the heart of the Giants order coming up. The first thing that surprised me was the body language of Ryan Hanigan prior to the first pitch. It was looking like Latos was getting frustrated in the first two hitters of the inning, but Hanigan was looking frustrated in this AB. Not sure if the frustration was the result of the dugout being late to relay in signs or with the calls of the umpire, either way it wasn't a good sign with an increasingly rattled Latos on the mound. As for Cozart, the play resulted in the worst possible outcome. It was a big moment and we needed either the out at the plate or the out at first. Instead, the run scores, a runner ends up on first, and we give away an out. If Cozart concedes the run and takes the easy play at first, then Latos faces Scutaro with 2 outs and no runners on base. If that happens, maybe Latos pulls it back together when faced with a clean slate. In an elimination game, the players simply have to execute. The Reds didn't. 2nd Pitch: 86 mph breaking ball, misses up and in - Ball 2. Scutaro showing bunt, pulls back and leans out of the way as the pitch is somewhat close to him. This was a terrible AB for Latos. Given that things were starting to slip away, the wisdom of a first pitch pitch-out can be called into question. The fact that Dusty called it may be another example of Dusty viewing speed as more impactful than on-base percentage, as he feared Pagan moving up a base more than spotting Scutaro, a professional hitter, an early advantage in the count. Latos was struggling and putting him in an immediate 1-0 hole was not ideal. Latos followed up by throwing balls all around the strike zone to walk Scutaro, never even challenging him, which is inexcusable ahead of Sandoval and Posey. Bryan Price visit to the mound. Sam LeCure up in the bullpen. At this point, the Reds go out to talk to Latos and the bullpen starts to heat up. Was it too late? Should they have visited the mound sooner? For example, prior to the Scutaro AB when it was apparent that Hanigan and Latos appeared frustrated and Cozart mishandled the chopper? Was that the time to visit the mound to break the rhythm of the inning to try to calm the team down and refocus Latos? Did they put too much trust in Latos? After the way Latos had pitched this season and during the playoffs, you could certainly justify it, but you could also justify warming up the bullpen in such a critical game. 3rd Pitch: 84 mph breaking ball off the outside corner, very good pitch by Latos, Pablo flips a soft liner to left field and the runners move up to 2nd and 3rd to load the bases. This AB was nothing more than good hitting. Pablo beat a good pitch, a pitcher's pitch, a pitch that wasn't even a strike. Tough to pin this one on Latos. Pablo executed in a big moment. 3rd Pitch: 92 mph fastball misses inside, a purpose pitch to set up 4th pitch? - Ball 2. 5th Pitch: 94 mph fastball. Hanigan sets up on inside corner, pitch drifts back right over the middle. Posey crushes it off the facing of the second deck in left. Mistake pitch. Grand slam. Done. Hanigan drops glove, spins away from the plate and takes steps towards the stands in frustration/disgust. Latos never turns to watch it go. No doubt where it was heading. This was pretty much the worst case scenario. Buster Posey is the NL MVP this year and I thought that before this series. He has controlled both sides of the game better than any other NL player this year. His ABs are just tremendous, he handles a pitching staff and controls the running game better than everyone. So, to face him with the bases loaded is as bad as it gets. No where to put him. No way around him. The highest leverage situation of the game and facing the NL MVP. It was a huge situation. Our best (healthy) starting pitcher against their best hitter. History remembers winners. The pitch that Posey hit was a big mistake, drifting back over the middle of the plate. It had good velocity, which is frequently results in a significant margin of error for the pitcher, but Posey can handle plus velocity without much difficulty. Once again, the Giants' players execute in a big moment, while the Reds' players do not. Maybe that's how all contests should be decided: best vs. best. An "I'm better than you and I can prove it" moment. That provides little comfort to Reds' fans who haven't experienced postseason glory in almost two decades. The day comes to an end for Latos. Was it too late? Did Dusty close the barn door after the horse had already escaped? Or, did Latos earned the benefit of the doubt? Credit Dusty for having faith in his fellas or criticize him for not utilizing the bullpen like it was a do-or-die game? Dusty has had tremendous regular season success, but limited postseason success. Is that due to his refusal to alter his managerial style to permit more micro-managing in the playoffs? Or, does this one fall squarely on the players for poor execution? Third Pitch: 91 mph fastball on outside corner. Ground out to Phillips. LeCure comes in and makes quick work of Hunter Pence. There is a theory that home runs are a rally killer. It's a theory that's frequently lampooned, but it appeared to be the case here, as the Giants went meekly against an inferior pitcher after the Posey grand slam. LeCure, once again proving to be a very capable and valuable long reliever type, makes quick work of Belt, recording the final out of the inning. In hindsight, it's easy to see how all the events came together to sink the Reds season. But, whether anything could realistically have been done to prevent it is arguable. You could argue that Dusty was too passive, managing this game no differently than he would have managed on opening day. You could argue that the pitch-out was ill timed. You could argue that Price should have gone to the mound after the misplay by Cozart, before the 4-pitch walk to Scutaro. Frankly, all three critiques are valid. It just seemed that things were gradually slipping away and Dusty/Price did nothing to stop it. Maybe, this was a case of Dusty having too MUCH faith in his players, lacking a sense of urgency in an elimination game. Or, maybe, because the damage was done largely on one swing of the bat, things just happened too fast to prevent. Player inexperience and failure to execute were also to blame. Latos had the opportunity to cement a legacy in Cincinnati. After coming into a difficult Game 1 in relief and putting up a dominating effort, Latos could have been the toast of the town. It was a moment. One that could be defining, but it's tough to say this early in his career. But, if he had followed that outing by shutting down the Giants in an elimination game, then he probably would have been King of the Queen City. However, it didn't happen. Latos' struggles to control his emotions may have played a part, causing him to lose focus. Cozart's nerves may have gotten to him on the chopper causing him to rush his actions. Finally, Hanigan failed to be a calming influence on Latos, which was surprising, but also seemed frustrated himself, which was even more surprising. I suppose we can hope that our young players will use this game to become battle-hardened veterans for future postseason games. A type of "learning how to win, Fast Eddie Felson style" process. But, future postseason appearances are never guaranteed and given how many chances the offense had to close the gap in this game, it's impossible not to be frustrated by the Reds' inability to, at a bare minimum, contain the damage in the 5th inning. In final analysis, the Giants executed in big moments, the Reds did not. Brandon Crawford made the plays, Zach Cozart did not. Buster Posey controlled the game, Ryan Hanigan did not. In honor of Homer Bailey's late season, spot-on Tom Seaver impersonation, including a no-hitter and a stellar postseason performance, now seems an appropriate time to revisit my preseason thoughts on Homer, which you can read here. At this point, it's looking like the question isn't whether Homer will be better in 2012, but rather by how much? If I was a betting man, then I'd have to look at these peripherals and say "quite a bit." One of the more interesting recent developments in the baseball universe is the attempt to strip away anything and everything that could cloud player evaluation, including narratives created by fans and baseball writers. In fact, I sometimes think that this "stripping away" comes at the cost of the pure enjoyment of the game. A compelling narrative may not always be relevant to player valuation, but it can certainly make the game more engaging and enjoyable for the fans. But, I digress, anyway, this "stripping away" development is driven by the emergence of statistical analysis, which has provided a newer and more accurate measure of the value of players. As the more accurate measure of player value became apparent, the narratives crafted by the fans and media began to ring untrue, whereas in the past there was far less ability to differentiate between the narrative and the truth. One of the players for whom the narrative had begun to overshadow the value appeared to be Homer Bailey. Not many players entered the 2012 season with more narrative baggage than Homer Bailey, who originally arrived on the MLB scene with massive expectations and who proceeded to consistently underwhelm all while displaying a questionable attitude. Homer's perennial struggles kicked up so much noise in the form of fan frustration that it was very, very easy to overlook the incremental improvement that he had been making. In fact, I admit to falling prey to that myself, as when I took an objective look at him this offseason, I was rather surprised by what I saw. Taking a look at four separate peripheral stats (BB/9, K/9, F-Strike%, and SwStr%) revealed that Homer was likely closer to figuring it out than fans, myself included, previously realized. Interestingly, Homer maintained the same exact walk rate, to the 100th decimal point, as he did in 2011, which is very encouraging given how impressive that mark was in 2011. F-Strike% is the percentage of batters that Homer starts off with a first pitch strike. Major League average is 59%. It's an important metric for the simple fact that getting ahead in the count permits the pitcher to tilt the probability of success in his favor. As good as Homer was in 2011, he was substantially better in 2012, evidencing vastly improved command inside the strike zone. In 2012, Homer posted the highest SwStr percentage of his career, which is encouraging given the correlation between swing-and-miss strikes and strikeout rate. Obviously, a strong strikeout rate is important to dominating pitching, especially when the pitcher operates in a launching pad like Great American Ballpark where contact frequently spells trouble. Homer maintained a posted the second highest strikeout rate of his career in 2012. Finally, while the four peripheral stats indicated a potential breakthrough to a new performance level, that breakthrough would have been far less valuable if it had not been paired with a heavy workload. 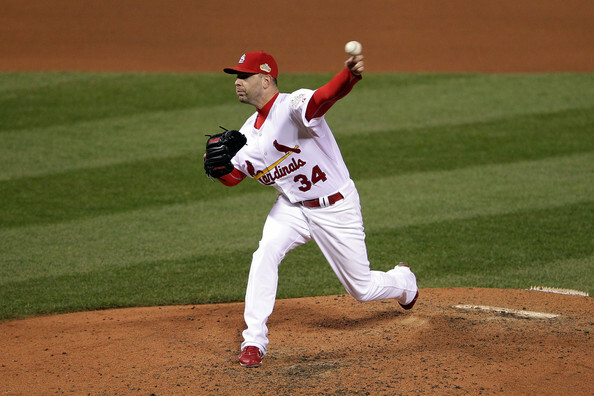 Prior to the 2012 season, Homer had never thrown more than 132.0 innings in a season. Obviously, 2012 was an entirely different animal, as Homer combined health and performance to break the 200 inning mark for the first time. When all was said and done, those peripherals and workload came together to produce a season of 3.68 ERA, 1.24 WHIP, and 168/52 K/BB ratio over 208.0 innings pitched. Granted, there were times when it didn't look like a breakthrough was coming and he continued a level of "own-age" of the Pirates that has rarely been seen in nature, but Homer excelled in the second half and took his game to the next level. While it is possible that Homer will regress in 2013, his peripherals indicate that this is a legitimate and sustainable breakout driven by incremental improvement in his game. Homer is actually looking like a top of the rotation pitcher on whom the Reds can rely in the future. That would be one of the biggest and most important developments of the 2012 season for the Reds franchise. In 2003, a book entitled "Moneyball" (perhaps you've heard of it) upended the baseball apple-cart, effectively overturning over a century of entrenched dogma, including ingrained beliefs, valuations, and standard operating procedures. Moneyball, as we all know, is about the existence of market inefficiencies and the manner in which the Oakland A's identified and exploited those inefficiencies. Statistical analysis was the tool by which the A's more accurately valued ballplayers than the market. What Moneyball did NOT explain was why these inefficiencies existed in the first place. That question was the precursor to the events of Moneyball. Shortly after publication, Michael Lewis began to look into this very question, a journey he documented in the December 2011 issue of Vanity Fair. His journey necessarily led him to the work of psychologist Daniel Kahneman. Kahneman, while studying the decision-making process, discovered that people unknowingly incorporate irrelevant factors into their decision-making process. This discovery was directly at odds with economic theory that viewed market participants as being rational and selfish. To identify the existence of market inefficiencies, you have to first conclude that the marketplace does not incorporate all readily available information of value. That the decisions of market participants are, in some respect, irrational. Kahneman's work made that conclusion easier to reach. One of Kahneman's research experiments was to rig a wheel-of-fortune. It was marked from 0 to 100, but was rigged to land on only 10 or 65. Kahneman would stand in front of a group of people, spin the wheel and ask the people to write down the number on which it landed, which of course was 10 or 65. He would then ask two questions: (1) Is the percentage of African nations among UN members larger or smaller than the number you just wrote? (2) What is your best guess of the percentage of African nations in the UN? The wheel was entirely unrelated to the question asked, but it affected the answers that were given. The average estimate of those who saw the number 10 was 25%. The average estimate of those who saw the number 65 was 45%. The group had included wholly irrelevant factors, which served as a kind of anchor for their thought processes/answers, in its decision-making. Kahneman's work led to the establishment of a sub-field of economics known as "behavioral economics." That field ultimately sparked the interest of Harvard undergraduate Paul DePodesta who went on to exploit the irrational decision-making of baseball market participants. While DePodesta put the work of Kahneman to good use, another premier baseball mind sought out Kahneman long before DePodesta discovered him. "Baseball men, living from day to day in the clutch of carefully metered chance occurrences, have developed an entire bestiary of imagined causes to tie together and thus make sense of patterns that are in truth entirely accidental. They have an entire vocabulary of completely imaginary concepts used to tie together chance groupings. It includes 'momentum,' 'confidence,' 'seeing the ball well,' 'slumps,' 'guts,' 'clutch ability,' being 'hot' and 'cold,' 'not being aggressive' and my all time favorite the 'intangibles.' By such concepts, the baseball man gains a feeling of control over a universe that swings him up and down and tosses him from side to side like a yoyo in a high wind." Whether or not ALL these phrases are "completely imaginary concepts" is still debatable, but those that are would be examples of irrelevant factors included in the decision-making process. The inclusion of such factors ultimately leads to the creation of market inefficiencies in Major League Baseball. On a micro level, it's almost impossible not to have James' premise in mind whenever you hear announcers, managers, or players prattle on about these concepts. I find that James' letter, to a certain extent, now frames my thinking on the subject. In the modern game, statistical analysis has become the tool by which smart organizations attack and exploit those unfounded beliefs that arose out of the efforts of baseball men to explain the discrete events of the sport. In an effort to give practical meaning to those events, baseball men incorporated irrelevant factors into their decision-making process. The flawed decision-making process created market inefficiencies; inefficiencies that could ultimately be exploited if those irrelevant factors could be identified and stripped from the decision-making process. Comment: On the infield fly rule the umpire is to rule whether the ball could ordinarily have been handled by an infielder —not by some arbitrary limitation such as the grass, or the base lines. The umpire must rule also that a ball is an infield fly, even if handled by an outfielder, if, in the umpire’s judgment, the ball could have been as easily handled by an infielder. The infield fly is in no sense to be considered an appeal play. The umpire’s judgment must govern, and the decision should be made immediately. When an infield fly rule is called, runners may advance at their own risk. If on an infield fly rule, the infielder intentionally drops a fair ball, the ball remains in play despite the provisions of Rule 6.05 (L). The infield fly rule takes precedence. And, if that doesn't convince you, then nothing probably will. But, if you still need MORE convincing, here's a strong take by Rob Neyer stating that the call was correct. The call was right. The Braves have no one to blame but themselves for the loss. If they wanted to win, they shouldn't have thrown the ball around like the Bad News Bears or hit Texas Leaguers in key situations. It's not the fault of the umpires and saying that it is cheapens the Cardinals' win and improperly damages the integrity of baseball officiating.